The new Project Panel on the left side allows you to easily arrange your sheets hierarchically and drag and drop scenes quickly to the corresponding sheet. Moreover, the new user interface supports some additional features which will make you even more efficient when using HoloBuilder. Get an overview of the improve navigation menu in the Project Panel. In contrast to the previous user interface, you can now see the structure of your HoloBuider Project at first glance. The new Project Panel displays not only the scenes but also the corresponding sheet, underlining the relationship between scenes and sheets. You can easily assign a scene to a sheet (cf. section 3.1 & 3.2) so that the scenes become a sub-element of the selected sheet. Click on the sheet icon to expand the sheet element and show all attached scenes or time-travel scenes. If all scenes are displayed, you can click once more on the sheet icon to hide the list of corresponding scenes again. Increasing the visibility of the overall project, only the names of the sheets and scenes are displayed. To show the thumbnail of a scene, just select the scene and the thumbnail appears at the top of the panel. The symbols before the name of an element indicate the type of the file. Sheets are displayed by two flat levels . If a sheet has scenes as sub-elements, the sheets are marked with a little drop-down arrow . Scenes are marked by a globe and time-travel scenes by a clock , as shown in Figure 1. If a 360° image is not placed on a sheet, the symbol is displayed in gray, for scenes , as well as time-travel scenes . Scenes, as well as sheets, can be selected by clicking on the name of the element in the Project Panel. When selecting a scene, the 360° image will open in the editor. If the scene is already connected to a sheet, the corresponding sheet will display in the sheet map. When selecting a scene that is not connected to a sheet, the sheet of the priorly selected scene will still be displayed in the sheet map. By selecting a sheet in the Project Panel, the sheet will show in the sheet map, whereas the scene will stay the same. Place a scene on the sheet as described in section 3.1 & 3.2 to connect it. Easily add new scenes and sheets by using the -button on the bottom of the panel. The -button stays at the bottom of the Project Panel regardless of the number of overall scenes. Hence, even if you have a project with many scenes, you can still easily add new scenes without having to scroll to the bottom of the panel. Selecting the button opens a dialogue, in which you choose between adding scenes, sheets, and time-travel scenes. Another quick possibility to add new scenes is to drag and drop files from your computer directly onto the -button. Just select the corresponding files in your finder and drag them to the -button at the bottom of the panel. Afterward, the new scenes will directly appear at the bottom of the Project Panel list. It is only possible to add scenes this way, no sheets or time-travel scenes. 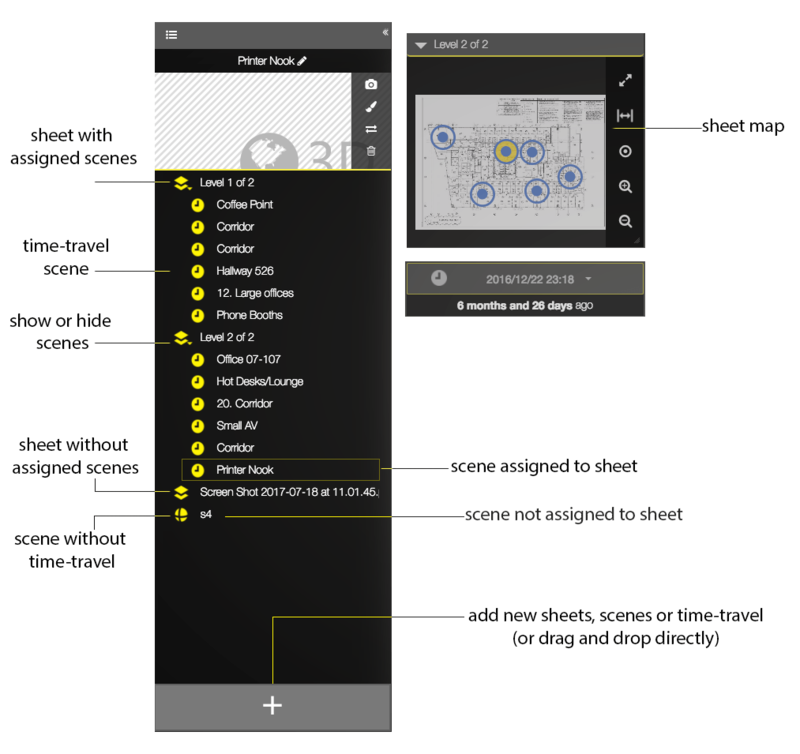 Scenes and time-travel scenes can be attached to sheets by dragging and dropping a scene from the Project Panel onto a sheet in the sheet map. Scenes that do not have a waypoint on a sheet are highlighted. A scene can be filed below a sheet but have no waypoint on this sheet. Select the sheet the scene is filed under and drag the unattached scene onto the sheet to create a waypoint. Click and hold the scene element and place it to the corresponding location on the sheet. Proceed like described above to place further scenes on the sheet. Alternatively, select the scene you want to place on the sheet in the Project Panel. Now, click on the location on the sheet in the sheet map to create a waypoint. Click on the corresponding sheet element in the Project Panel to show in the sheet map. Now, drag and drop any of the unconnected scenes or time-travel scenes from the Project Panel to the sheet. Release the scene on the location you want to place the waypoint on the sheet. Alternatively, you can select any other sheet and proceed as described above to assign scenes to this sheet. To change the location of a waypoint, simply click on the waypoint or select the scene in the Project Panel. Click on the location on the sheet in the sheet map to move the waypoint of the selected scene. You can relocate scenes that are already placed on a sheet by either dragging and dropping the scene element in the Project Panel to file below another sheet. The waypoint will be automatically placed in the exact same location as it was on the previous sheet. The waypoint on the previous sheet will be removed. Alternatively, expand the sheet element you want to move the scene from in the Project Panel. Now, select the sheet you want to move the scene to. The sheet will show in the sheet map. As described before in Section 3.1 and 3.2, click and drag the scene you want to move to the new sheet and place it on the sheet to create a new waypoint. The waypoint on the previous sheet will be removed. Remove a scene from a sheet by dragging and dropping it out of the sheet element in the Project Panel. The waypoint will be removed from the sheet and the scene will not be assigned to the sheet anymore. Alternatively, to only remove the waypoint from the current sheet, right-click on the waypoint in the sheet and confirm. The waypoint will be deleted but the scene will stay filed below the sheet element in the Project Panel. Waypoints get automatically removed when deleting a scene from the Project Panel. The Project Panel allows for an easy and direct organization of your scenes, sheets, and time-travel scenes. You can reorder your sheets including the connected scenes in the Project Panel. Click and drag the sheet element you want to move up or down in the list. Move the sheet to the corresponding place in the list. Make sure to have the sheet on the right level as indicated by the black arrow. It is not possible to add a sheet to another sheet. The order you arrange your sheet elements in the Project Panel in will also be the list order shown in the sheet drop-down menu to select the sheet in the sheet map. Any kind of scene can be moved by clicking and dragging on the name of the scene element in the Project Panel. You can move the scene either to file to a sheet or simply change the order of the scenes. The scene order can be either arranged within a single sheet or for scenes not (yet) connected to a sheet. When moving a scene from one sheet to another sheet, the waypoint will be placed in the exact same location as it was on the previous sheet. If the scene does not (yet) have a waypoint on the sheet, no waypoint will be created when rearranging the scene below another sheet (cf. section 3.4). Same holds when moving a scene not yet connected to a sheet is filed below a sheet. Any kind of scene can be dragged and dropped anywhere in the Project Panel. A scene can be also rearranged to be removed from a sheet (cf. section 3.5). Scenes and sheets can have properties that can be adjusted individually. Each scene or sheet in the Project Panel has a preview to better recognize which scene or sheet is currently selected. The preview will change each time another sheet or scene gets selected. You can rename your scenes and sheets by clicking on the current name of it. In the properties popup, change the name of the scene or sheet accordingly. Save your changes to apply. Click on the name of the scene or sheet to open the properties. In the popup, change or add a date to your scenes to better sort them for Time Travel and keep track of any changes or progress. Setting a date for a sheet can help keeping track of the right sheet version being used. The scene or sheet descriptions can help in teams working on a single project to communicate directly about a certain scene or sheet. Add notes for yourself or any coworkers which might have to be considered in further developments. For each scene, you can set a fixed orientation of the scene for when it is being opened. This helps to set a focus of an individual scene or a direction when building a tour. Rotate your scene to the right perspective, zoom in or out, and click the camera icon at the right border of the scene preview to set the orientation of the scene. This feature is only available for scenes including time-travel scenes. Add filters like saturation, distortion, contrast, and face blurring to your 360° image. Combine any filters and test them with the live preview. Click on the icon next to the scene preview to open the filter settings. To exchange the file of an existing scene or sheet, click on the two opposing arrows on the right of the scene preview. In the popup, browse your computer for a new photosphere or sheet file. Changing a scene: Your 2D/3D objects will not be removed and stay at the given position in the scene. Changing a sheet: Any waypoints already added to the sheet will stay as they were. Note: You can duplicate a scene to clone the inserted objects and add a new photosphere. Click on the trash bin to delete a scene or sheet. Deleting a scene: When deleting a scene, all included objects will be deleted as well. If a scene is attached to a sheet, the waypoint will be removed from the sheet. Deleting a sheet: When deleting a sheet, it will be completely removed from the Project Panel. Any subsidiary scenes will become unassigned of a sheet. However, no scenes will be removed. Time-travel scenes can be moved and edited the same way as any other kind of scene. Drag and drop your time-travel scenes to a sheet as described in section 3.1 & 3.2. Change the time of your time-travel scenes with the drop-down menu below the sheet map. Adjust the properties for each time-travel as described in section 5. If you still have any questions about Project Panel or HoloBuilder in general, please let us know by e-mail at support@holobuilder.com or via our integrated live chat on holobuilder.com. This entry was posted in HoloBuilder Tutorials, What's new? and tagged 360 degree panorama, construction, editor, floor plan, full spherical images, HoloBuilder, improvement, Multiple sheets, photo sphere, project panel, Sheets, Time Travel, Tutorial, virtual reality, virtual tour, VR. Bookmark the permalink.